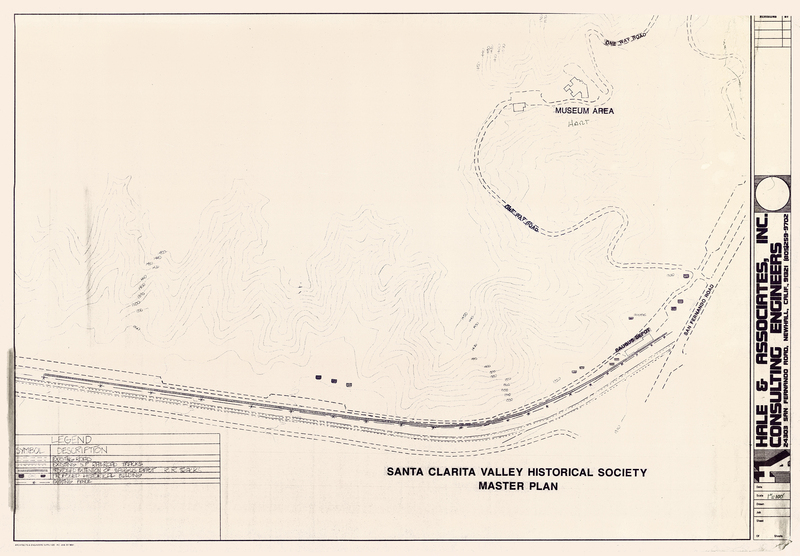 SCVHistory.com HS8002 | Heritage Junction | Blueprints: Mitchell Adobe Relocation, Heritage Junction Master Plan, 1986. Blueprints for the 1986 relocation and reconstruction of the Mitchell adobe ("adobe building") at Heritage Junction Historic Park, located on the "Frew property" inside William S. Hart Regional Park in Newhall. 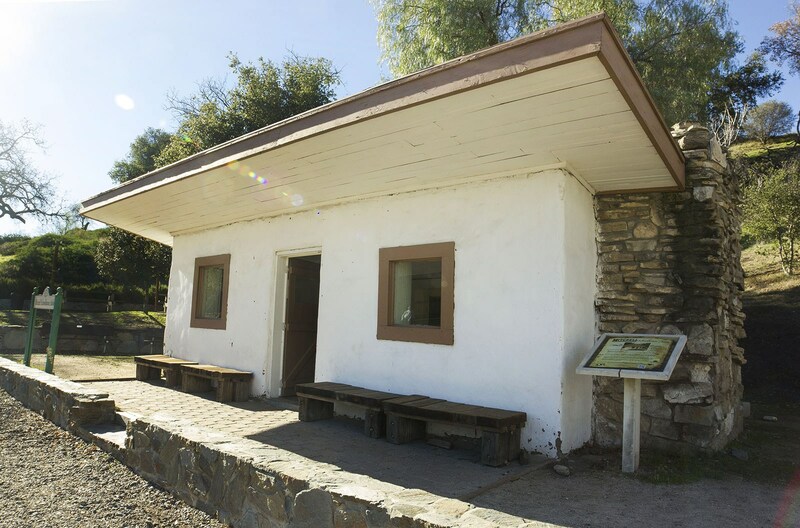 The adobe was bulldozed at its original location in 1986 and reconstructed at Heritage Junction by Santa Clarita Valley Historical Society volunteers between 1986 and 1989. First blueprint (of 2) shows Heritage Junction master plan with proposed location for the Mitchell adobe, as well as the existing road, existing Southern Pacific Railroad tracks, proposed extension of Saugus Depot railroad tracks (not done) and the existing fence. Second blueprint shows foundation plan and roof plan and describes the reconstruction process. 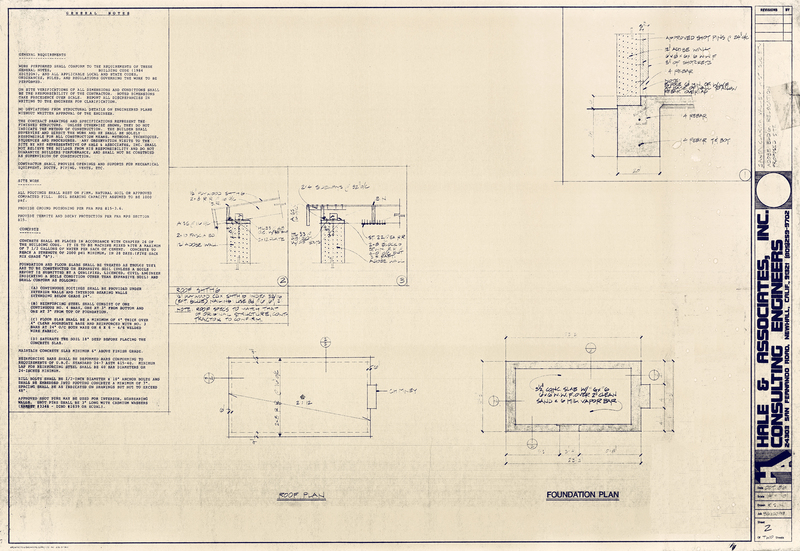 Blueprints by Hale & Associates Inc. Consulting Engineers (Don Hale) of Newhall, October 1986. Restored Mitchell adobe at Heritage Junction Historic Park, Newhall. Photo ©Jessica Boyer 2016. Click to enlarge. Colonel Thomas Finley Mitchell, a veteran of the Mexican-American War, moved a miner's shack to Soledad and Sand Canyons in 1860 where he lived and headquartered his 160-acre ranch. After he married Martha Catherine Taylor in 1865, he constructed a large adobe, using parts of the miner's shack. After the Colonel had increased his holdings to 1,000 acres, Martha began the Sulphur Springs School in 1872, with classes being held regularly in the kitchen of the adobe. It moved to the Lang Hotel and Spa in 1879. The first students were from the Mitchell, Stewart and Lang families. In 1886, a regular school was built by John Lang and Sanford Lyon on land donated by the Mitchells. By 1919, the old adobe had fallen into ruin, but was salvaged by the Colonel's son-in-law, Walter Murphy. He used the remaining adobe bricks to erect a home for the ranch foreman. It later served as a guest house, apiary and tack room until it was destroyed by developers on August 14, 1986. What remained was moved to Heritage Junction, dedicated on November 5, 1989, and has been restored. The adobe was originally 45 x 60 feet, and made of clay dug from a layer deep in a hand-dug well. The roof was covered with either split redwood shake or a very thin cedar shake. It had a wooden floor constructed of light-colored wainscoting. As of 2012, the original Mitchell home site and the surrounding land are set to be developed into the mixed-use Vista Canyon Ranch project. Tom Mitchell of the Soledad by Richard F. Mitchell, 2002. Story of Sulphur Springs School by Leon Worden, 1997. 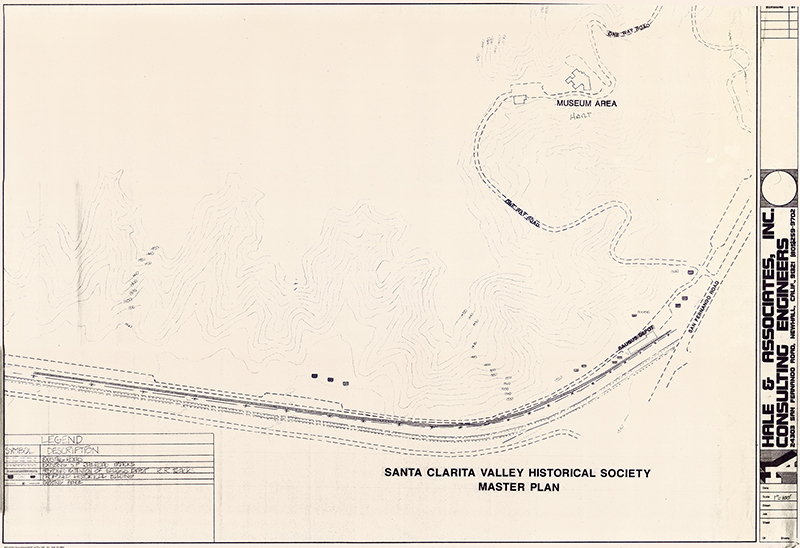 HS8002: PDFs and 9600 dpi jpegs from original blueprints, Santa Clarita Valley Historical Society files.